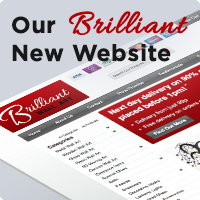 Blog › Information › Brilliant Wall Art's New Look!!! Incase you haven't noticed, we've refreshed our Website design, making it easier for you to see all our categories and offers available. Perhaps you'll need some advice on the best place to position your new piece of artwork, or wish to view other products which maybe of interest to you throughout our large range? You will now notice written suggestions throughout our categories to advise you. We simply wish to make your browsing experience the best it can be with us. Whether you are searching for the perfect gift, or simply the ideal piece of artwork to match the decor of a room, we can provide...with so many different pieces and styles of artwork to choose from, you'll be spoilt for choice. Don't forget to take a look at our latest collection of exclusive wooden wall art, only sold by us. Or perhaps you want to bag a bargain? Then check out our special offers range, or our clearance category. We offer a next day delivery service for UK mainland! For more information about our delivery costs and your pricing zones, please select the link. Call us if you would like more information about any of our art collections. Why not welcome creativity into your home or office today!